From concept to completion! 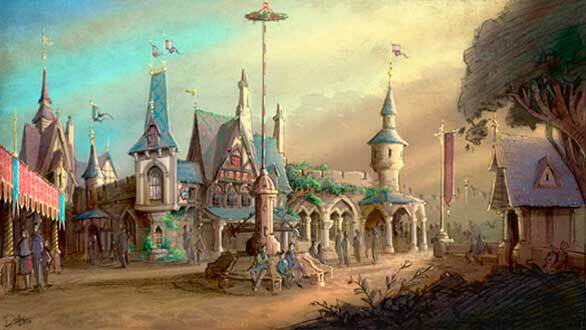 Check out the above concept drawing for Fantasy Faire Village [Disneyland], isn't it gorgeous? While Fantasy Faire Village won't officially open to the public until March 12, 2013, we have 3 videos of this absolutely beautiful new Disney Princess themed, storybook village. Take a sneak peek at what Disney Princess fans have to look forward to on opening day! Check out the sneak peek walk through of Fantasy Faire Village and the two new live theatrical shows [ Beauty and The Beast and Tangled ] that will be playing at the Royal Theatre in Fantasy Faire, beginning March 12th. Fantasy Faire Village is located right next to the Sleeping Beauty Castle, in Fantasy Land. The picturesque storybook village offers Princess enthusiasts of all ages the opportunity to meet their favorite characters from the following Disney classics: The Little Mermaid, Cinderella, Sleeping Beauty, Tangled and Beauty and The Beast. The Royal Hall is one of the main attractions in this quaint storybook village. Your little princess can always count on meeting her favorite Disney Princess characters at the Royal Hall! The Royal Hall features a beautiful gothic interior and breathtaking chandeliers. Don't leave Fantasy Faire without a trip to the charming Fairytale Treasures shop, where you will find tons of special treasures to remember your visit by. If you get hungry on your visit to Fantasy Faire Village, stop by Maurice's Treats, a little food invention wagon where Belle's father offers a signature drink and savory and sweet twisted bread sticks!